Following extensive review and collaboration with various stakeholders, the following Uniform Policy with take effect from 1st January 2015. • helping to build ABF loyalty amongst representative players. The ABF Strategic Plan 2013-17 articulates the goals of the organisation – including enhancing the profile of bridge within the Australian community. Strategies identified to achieve this goal involve attracting international players to our events and for Australia to host major international competitions in the future. 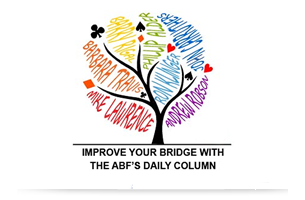 Hence, projecting a positive, professional image for the ABF whilst on any international stage is a critical issue for the Australian Bridge Federation. a) Doing away with the Australian coat of arms and replacing it with the ABF logo. b) Providing: 2 coloured shirts; one matching colour spray jacket or similar. We will continue to provide magnetic badges. c) The ABF will assist teams in the purchase of shirts and jackets. It will then be up to the players to maintain their issued clothing in good order. Any damage or loss which necessitates the replacement of a spray jacket will be at the expense of the players, however 2 shirts will be issued each year. If any player wishes to avail themselves of additional clothing the ABF Secretariat may assist with the purchase. d) The colour of the shirts is to be consistent from year to year to ensure re-usability of the clothing. e) The Uniform Policy will be included as part of the Players’ Charter. f) The Uniform Policy will take effect from 1st January 2015 and will remain in force for a period of 5 years. g) The Uniform Policy will apply to all ABF target events for Open, Women’s, Seniors and Mixed Teams. The Uniform Policy will also apply to the Youth, where they are playing at the same venue as the other teams. h) It will be the responsibility of the NPC of each team to advise what size and what items of clothing each player will require. Individual players will then need to make their own arrangements about collection of clothing.